The Maryland judge who threatened to approve tickets for all Pontiac G8 owners over their stock tail lights has backed down, reportedly saying she "misunderstood." Vehicular freedom's having a good week in the Old Line State. To recap: The judge had issued an $85 fine to the owner of a Pontiac G8 GT for illegal tail lights ticketed by police, and ruled even the factory version would be illegal under Maryland law, despite being approved by the U.S. Department of Transportation. 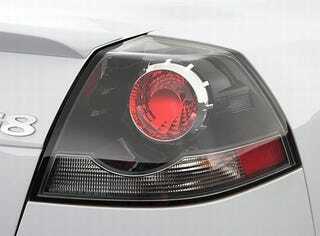 Thing is, Altezza-style tail lamps can be found on dozens of cars, and are a mainstay of the aftermarket. Thanks to a local state's attorney who has similar lamps on a Lexus, not only were the charges dismissed, but the owner of the G8 received an apology from the supervisor of the officer who wrote the ticket.